This article was reposted with permission from Brad Brown, CEO of Christian Heritage. Incarcerated dads and their little girls spent quality time together at the second annual father-daughter dance held at the Omaha Correctional Center. The hour-and-a-half-long event on Feb. 26 was an opportunity for 14 girls and their fathers to cut loose, eat snacks, celebrate the men’s impending reentry into society (the participating inmates are set for release in the near future), and continue nurturing their parent-child relationships. 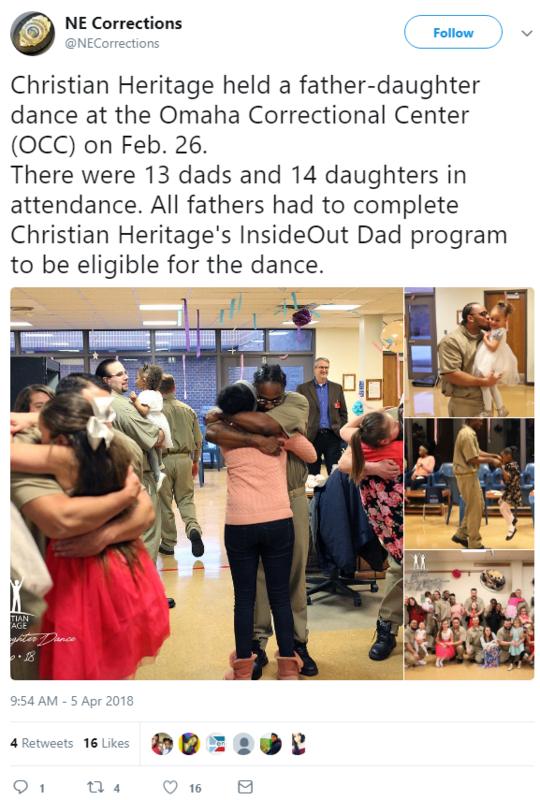 In order to attend the dance, the inmates were required to complete a curriculum called Destination Dad, offered by Nebraska-based foster-care agency Christian Heritage. “We’ve found that inmates who complete the program are generally more well behaved than those who don’t, and it’s an incentive to spend time with their families,” Brad Brown, chief executive officer of Christian Heritage, tells Yahoo Lifestyle. The first course of Destination Dad is called “Inside Out Dad,” which teaches men how to reconcile their histories and learn life skills. Once completed, the fathers earn “Daddy Day Visits” in more relaxed environments than standard visits, which typically restrict parents and children from physically touching. During visits, a father can read a book to his child that is recorded on a DVD and later sent to the child as a keepsake. The experience is so effective, says Brown, that kids who play back the DVD at home often feel as though their father is with them in the same room. Christian Heritage has thrown two other dances in local prisons and recently held a father-son day for boys to play board games and catch with their dads.